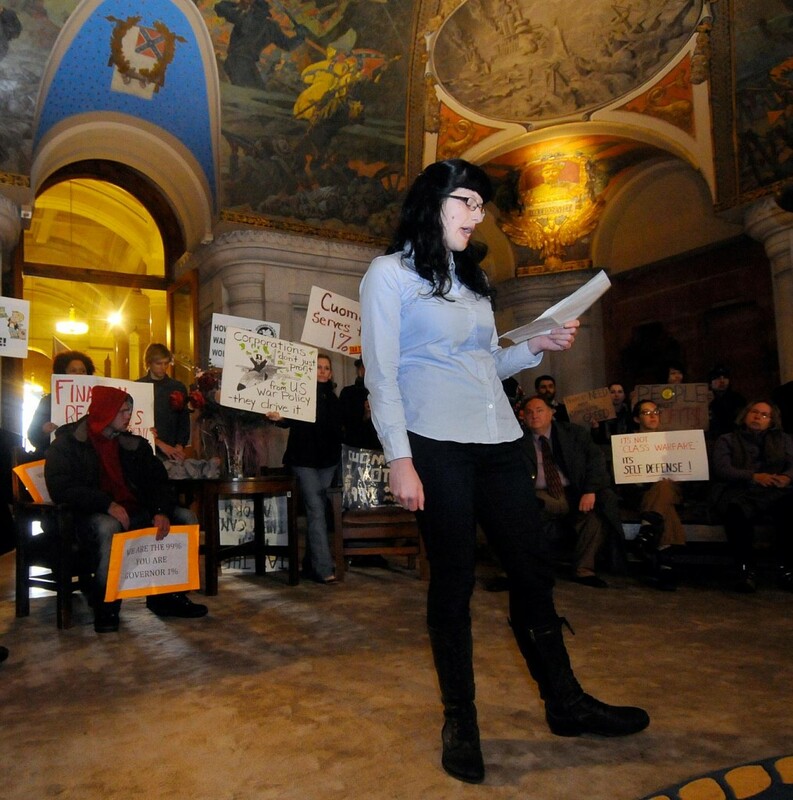 Jackie Hayes of Binghamton, N.Y., speaks in support of Occupy Wall Street at the state capitol in Albany, N.Y., Thursday, Oct. 27, 2011. It is difficult not to notice that young women are conspicuously at the forefront of this movement. With the development of the Occupy movement over the last six weeks, I have become interested to see what Frye has to say about anarchism. A collection of references is going up tomorrow. Here are a few preliminary observations. Frye not surprisingly makes a distinction between peaceful and violent anarchism. He also reinforces a distinction between anarchism and Marxist socialism. In a 1967 notebook entry he says that we live in an age of anarchism, and that is his repeated assertion in his published work. His emphasis is to identify the constructive aspect of anarchism, which he believes deeply informs our social and cultural development since at least the Romantics. Just as culture, rather than economics, is constructively laissez-faire, it is also anarchistic, and that is the right direction for this creative energy to run, otherwise there is always the possibility of violent social disruption. History seems to demonstrate as much. As always with Frye, culture trumps ideology. Whatever the Conservative Party of Canada and the U.S. Republican Party may think, both countries possess a radically anarchistic element in their national character, and have from the beginning. It is primary and not just incidental. Finally, Frye recognizes that the beats of the 1950s and the hippies of the 1960s suggest the “faint beginnings” of a new phase of anarchism. The case can be made that those faint beginnings have steadily matured to become a more effectively activist expression of social concern, perhaps best represented at the moment by the rapid and unexpected emergence of the Occupy movement. That said, it is always worth adopting Frye’s disciplined long view and not prematurely jump to the conclusion that everything is going to change for the better overnight. There are powerful political and economic forces lined up against it. As Frye says in The Double Vision, “Hope springs eternal. It just tends to do so prematurely.” This apparently revived anarchism, however, may represent a generational shift. It therefore might emerge more powerfully and permanently in the foreseeable future. It would certainly be consistent with the anarchistic element embedded in North American society as a whole. It’s no secret that the greed of the top percentile of those currently in charge is unsustainable, from whatever direction you approach it. The young men and women out in the streets seem to know that better than their elders. More recent Occupy photos after the jump. This entry was posted in Frye on Anarchism on November 2, 2011 by Michael Happy.